David Wildish's Blog – British expat in Thailand. Interests: travel, photography and urban exploring. Coffee in Thailand is getting better every year. What was once a small industry with limited offerings from local producers and the usual ubiquitous international brands (hello Starbucks — yes, I’m talking about you) is now a diverse and growing industry with a large range of options. There has been a huge boom of boutique coffee shops over the last few years in Bangkok. Ink and Lion Cafe, PACAMARA and Artis are some of my favorites, all of which serve extremely high quality coffee at prices that aren’t all that bad considering you’re in a large, international metropolis. Another good option is Roots in Thonglor, although prices are getting up there. Coffee chains in Bangkok have gone from passable to decent over the last few years, I assume because of competition from the boutique places listed above. The Coffee Club has several branches around the city that are all decent, and places like Coffee World and Tom N Tom’s Coffee have expanded quite rapidly and now see to be almost as popular as Starbucks. As for Starbucks, it’s still the giant it has always been and seems to have lost none of its status as the “prestigious” international coffee chain. One of the cool things to have happened over the last few years is that more cafes in Bangkok are selling their beans (usually whole, although sometimes pre-ground) for visitors to take home and prepare on their own. You can pick up beans from most small coffee shops, as well as from the usual popular local chains like Doi Chang. Nespresso has also made it to Thailand over the past few years, both in its espresso capsule form and as larger Dolce Gusto pods. Pricing is a bit on the high side but the taste and selection of the Nespresso coffee is quite good (you can compare the best Nespresso capsules here). There’s even a boutique store inside Siam Paragon with a variety of capsules for you to taste test before you buy. Bangkok is doing well when it comes to cafes, although it’s still behind cities like London or Melbourne. I expect to see more boutique cafes popping up over the coming years, and in smaller, less well known neighbourhoods outside the usual Thong Lor, Phrom Phong and Asoke bubble. Shopping options are limited in the south of Thailand, so I tend to pick up my new clothes when I get a chance to visit Bangkok. 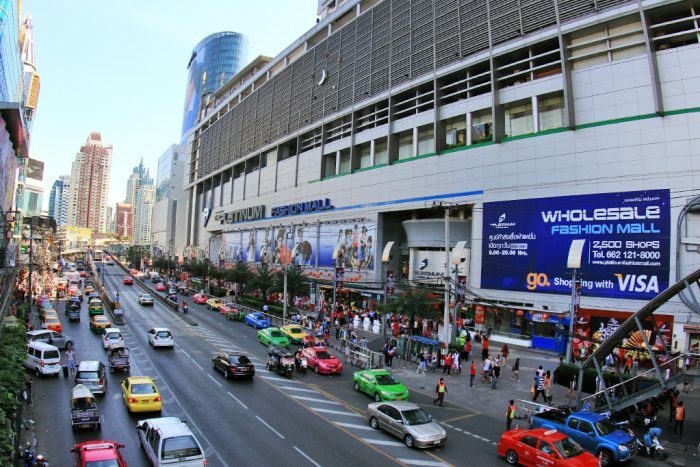 One of my favourite places to shop is the Platinum Fashion Mall, which is located close to Chit Lom BTS (from the station, walk to Central World, then use the elevated walkway). Compared to other malls in Bangkok, of which there are many, products at Platinum tend to be on the cheap side. The quality isn’t quite what you’d find in a brand name store, but for t-shirts and other simple clothes I don’t need anything particularly fancy — simple stuff from China will do the job just fine. Anyway, most of the big brands make their clothes in the exact same factories. One advantage of Platinum is that it has an excellent food court. I swear the food court there is one of the best in Thailand. Prices are cheap, as you’ll find at most food courts in Thailand, and the quality of the food is excellent. Thinking of visiting Platinum? Gate 20 has a great guide to “surviving” in the mall (it can be a bit of a confusing place at times because of the long, thin aisles) that’s great for first timers in Bangkok.